Hakone-Yumoto Station (箱根湯本駅・Hakone-Yumoto Eki) is the gateway to Hakone, a popular hot spring region two hours southwest of Tokyo. While the Hakone Tozan Line technically starts at Odawara, Hakone-Yumoto marks the start of the line's steeper switchback section as it climbs into the mountains. Different cars are used along the switchback track than on the section from Odawara, so visitors always have to get off at Hakone-Yumoto and wait for the next train. 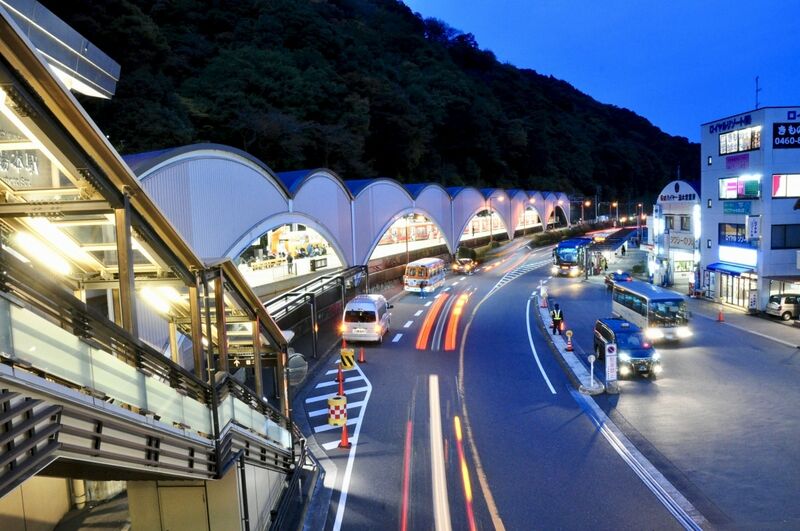 Since trains are a little infrequent (every 10 to 20 minutes), this means most visitors to Hakone will spend some time meandering the station area before heading further up into the mountains. Fortunately, the street beside Hakone-Yumoto Station is lined with about 200 meters (220 yds) of shops selling all sorts of (largely edible) souvenirs. Right under the station's west steps you'll find the Eva Store (箱根湯本えゔぁ屋・Hakone-Yumoto Eva-ya)—placed here because the highly popular Neon Genesis Evangelion anime was set in Hakone, with the lead character spending quite a lot of time at a fictional version of Hakone-Yumoto Station. If you're planning on doing some shopping after exploring, be aware that most of the shops along Route 1 shut rather abruptly right at 6 p.m. Most people will meander about a block southeast to find Ajisai Bridge (あじさい橋・Ajisai-bashi) and the Hayakawa River, offering a view of some of the many, many hot spring resort hotels in the area. But a better view can be found if you head about 200 meters (220 yds) west down Route 1—past all the shops—and turn left. Here you'll find a lovely little bridge and a collection of picturesque shops and hotels hidden away on the other side (see top photo). 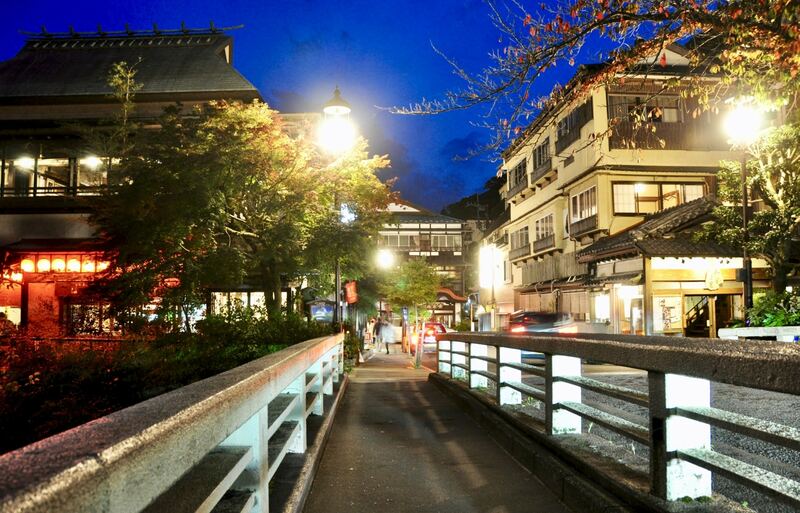 Either bridge will lead you to Soun-ji Temple (早雲寺), located on the hill on the far side of the river. Dedicated to Hojo Soun (北条早雲), the Hojo lord who first took control of Odawara Castle, it was built under Soun's son following his father's death in 1519, most likely constructed in 1521. The temple burned down when Toyotomi Hideyoshi took Odawara Castle and crushed the Hojo Clan in 1590, but it was rebuilt in 1627. Now registered as an Important Cultural Property of Japan, five generations of Hojo tombs can be found on the site. If you arrive during the day and you've got lots of time, you might want to head out to Forest Adventure Hakone (フォレストアドベンチャー箱根). Located about 10 minutes' walk northwest of the station, here you can feel like a kid again as you climb and glide through the trees. So even if souvenir shopping isn't your thing, there are plenty of things to occupy your time around Hakone-Yumoto Station!